BROMO JAVA TRAVEL is an experience travel agent located at Probolinggo City, East Java Island Indonesia. We provide Mount Bromo tour package option for domestics and foreign visitors especially for East Java Island Indonesia that included all nature tourism around East Java Island. 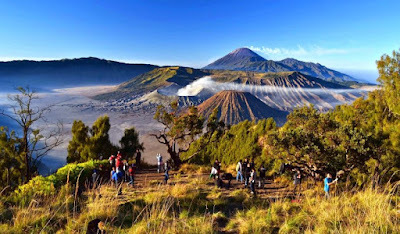 Bromo mountain is the best destination tourism for domestic and foreign tourist in east Java Island of Indonesia it’s location exactly in the middle between Probolinggo, Pasuruan, Malang and lumajang regency. This volcano has 2,329 metres (7,641 feet) above sea level and it is an active volcano has been a part of the Tengger massive in East Java Island, Indonesia. Bromo is not the highest peak of the massif but it is the most well known, the most expensive price in tourism arrange because this volcano has various interesting places to see Sunrise, Milky Way, Prewedding, and other purpose until become one of the most visited tourist attractions in East Java Island. JEEP 4 WD (four wheel drive) is the most suggested transportation and special to enjoy the Sunrise, by The Jeep 4 WD you can start from Hotel area at 03:00 AM for about 30 minutes driving to the view point or Pananjakan peak at 2,770 m above sea level or 9,088 feet. After you get the stop of Panajakan then take a walk to view point and waiting for sunrise rising at 05 : 20 AM, while see Mount Bromo Milky Way from the rest area. Then start your time to see the sunrise and Semeru volcano summit (from this peak, You will also able see many lights used by visitors who do Semeru volcano hiking) at 3,676 m (12,060 feet) and also all the other mountains like Mt Batok, Mt Kursi, Mt Widodaren, Mt Watangan. after finish, comeback to the jeep then continued to the second stop at sea of sand and start to walk to the top of Bromo volcano about 20 or 25 minutes by walking or you can take the horse riding transportation for 15 minutes to front of stairs which has 240steps. after finish enjoy the crater, you can continue to savannah hill and Whispering Sand for 20 minutes from Sea of Sand parking lot or directly comeback to the hotel.